Cocker Spaniels: Don't You Just Love 'Em? I love Cocker Spaniels, don't you? Long floppy ears, adorable brown eyes and an ever-cheerful curiosity - that's what makes them so irresistible! Hi! My name's Max. Welcome To My Mom's Website! In fact, my passion for Cockers is the reason I created this website. The photo to the right (and the one above) is of my faithful companion Max. 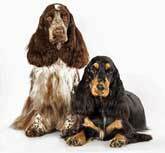 We'd like to welcome you to our online guide to caring for Cocker Spaniels. Why not let us help you through those first few scary weeks of your puppy's life, and then on to adulthood and through to his senior years? This website offers all you need to help your puppy grow into a happy, healthy, adult Cocker Spaniel. Click on any of the small photos underneath to find tips and advice on how to take care of your Cocker Spaniel. You can also click on any of the links in the left-hand column. So You Want To Buy A Cocker Spaniel Puppy? Getting a puppy is a big commitment. And as your dog is likely to live up to 15 years, it's a commitment that shouldn't be taken lightly. There are many other things to consider before you make the decision to buy your Cocker Spaniel puppy, but the main ones are cost and time. Cocker Spaniel puppies don't come cheap! Aside from the initial price you must be sure that you can afford the essential extras. For example, your puppy will need a bed, a crate, a couple of warm blankets, a collar and lead...just to mention a few! Then there's ongoing expenses, such as food, vet bills, pet insurance, boarding kennels and the cost of a grooming parlour, should you decide to use one. You also need to be certain that you have enough time to spare. Cocker Spaniels need exercising every day for at least one hour. As with all dog breeds, they will need obedience training to shape them into well-behaved puppies. That's at least another 30 minutes each day! Socialization is vital if your Cocker is to become a happy, confident adult dog. This can easily eat into an hour each day during his first few months. Then there's time needed for potty training, feeding, cleaning up after little accidents, playtime, cuddles. Still convinced you're up for getting a dog? Good. Now the excitement begins! Bringing a new puppy home can be nerve-wracking, especially if this is your first puppy. There's just so much to learn about being a puppy parent and I'm sure you'll have hundreds of questions to ask! This is where I can help. Puppies are a little like babies: they can't do anything for themselves. They will need your care and guidance for many months. They'll also need lots of love (that's the easy part!). My new puppy care guide covers all areas of puppy ownership. It includes essential help with the basics such as feeding, potty training, and bath-time. It also covers grooming, as well as playtime, crate training and obedience training. You'll also find a useful step-by-step article on how to set up your puppy's daily care routine. This should help you look after your new little boy (or girl!) during those all-important first few weeks. You love your new pup and you want him to be a well-mannered, obedient little boy, right? Right! But it's not always that simple, is it? An untrained puppy can (and usually does!) get up to all sorts of mischief. If left to his own devices, he can develop some pretty unsociable behaviors! So the sooner you begin his training, the better. Don't mess with me, I'm tougher than I look! Although puppy training is (and should be) fun, it can sometimes also be frustrating. Especially when it's obvious your puppy doesn't understand what you want from him. When this happens, it's up to us to help him understand what we want from him. Our goal will be to teach him what type of behavior is acceptable and what's not! You'll find plenty of tips on training your puppy to help you to get the best from him. They'll also save you lots of time and heartache! Your Cocker may be partly house-trained when you bring him home. If that's the case, potty training is going to be one of your top priorities. Another priority may be to teach him a few simple obedience training exercises. Obedience training is your first step to a well-mannered little Spaniel. How To Give Your New Puppy Confidence! Give your new puppy the confidence he needs by socializing him every chance you get! You only have a small window of opportunity, so it's best to begin as soon as you get him home. Socializing your puppy is the process of exposing him to everyday sounds and sights. It will help him to become familiar and comfortable with many different experiences. Socialization is a vital part of your puppy's training and development. It will help him to grow into a well-behaved, happy, Cocker Spaniel dog. I cannot over-emphasize this point! If your pup doesn't get the socialization he needs, he may grow up to be nervous and timid. He will jump at the slightest noise or sudden movement and may shy away from contact of any kind. His fear and anxiety may cause temperament problems such as bad behavior or aggression. An under-socialized puppy will usually grow up to be an unhappy dog. These are the main reasons why socializing your puppy is so important. Naturally, you'll want your Cocker's coat to look clean, healthy, and in great condition (and you'll want him to smell nice too!). I don't need grooming yet, I'm just a puppy! A good diet always helps, but if you check his coat regularly, and brush him daily, (paying special attention to those feathers when they begin to grow in) you'll certainly get the results you're looking for! Professional dog groomers can work out quite expensive. If money's tight, why not learn how to groom him yourself and save some hard-earned cash in the process? If you decide to use a professional groomer, this article will help you to choose a good one. You'll find lots of useful tips and advice on all aspects of grooming your dog. You'll also discover which grooming tools will help to keep your Spaniel's coat looking healthy and in tip-top condition. Your Spaniel's health is important and as loving owners we do our level best to make sure our dogs stay healthy. I'm being soooo good. Where's my treat? A problem area for Cockers is their pendulous ears. Cocker ears are beautiful but they're prone to stubborn ear infections. It's important to keep them clean to keep bacteria and infection at bay. And let's not forget dog fleas and ticks - just hearing those words makes me itch! 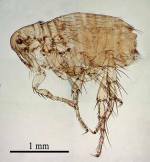 Keeping your dog free from fleas by using a regular flea treatment will also keep your home a flee free zone too! There are many illnesses that can befall your pet, (too many to list here!) but there are steps we can take to keep them to an absolute minimum. Regular exercise and good grooming habits are essential for your dog's well-being, but you can help to boost your dog's health by feeding him a diet that is wholesome and nutritious. There's much more to this website than I can possibly mention on this homepage. To explore the site you can use the navigation buttons to the left of each page. To see a list of all the web pages, you can browse the Site-Map. If you're looking for something specific, there's a handy search box on the top left-hand corner of each page. I'm always adding new material so please come back and visit us often to find out what's new. If you've any ideas for additions or improvements to the site, or even if you just want to say hello, please use the Facebook comments below. I hope you come in for a while and enjoy browsing through my website! PS: One last thing I need you to know - I'm not a vet, a dog behavior therapist, nor am I a breeder. I'm a fellow dog lover with an all-consuming passion for Cocker Spaniels. I have a great deal of knowledge and experience that I'd like to share with you. If you have any urgent worries about your pet's health, I urge you to speak to your veterinary.